The Wall Street Journal has an interesting article about how people make decisions and whether this actually leads to happiness. Read it HERE. I am not certain if it is behind the paywall, so I have taken the graphic and embedded it below. 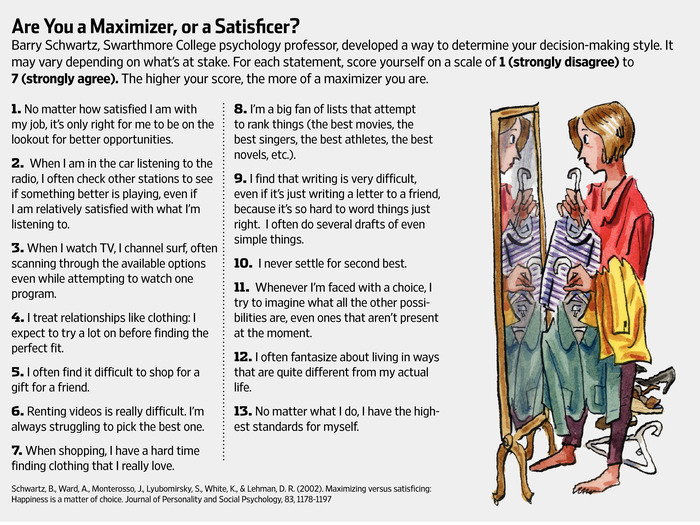 Find out whether you are a satisfier or a maximizer. Logically the satisfier is always a happier person, but the maximizer tends to get the better and higher paying job. So the question becomes, which one are you? In thinking about it on a typical basis. When hubby and I went to lease a new car, I basically did the research before hand. We knew we liked Hondas. We knew how much we wanted to spend on the lease. We knew we wanted to trade in our Honda Pilot early if possible. Of course we decided to stay with Honda. I tool around in a little CRV right now. It's a bit of a tighter squeeze for the boys, but everyone adjusted just fine. Honestly I like it alot. I get a kick out of it. I really do. In all honesty, I am not certain whether this really makes me a satisfier in one respect or a maximizer in another. I figure it simply makes me a consumer with my likes and dislikes. Now I do know that when it comes to special needs though, I am a maximizer. Not content with only one answer, I research, I explore and I delve into the world in order to try to find answers that best suits my boys. No matter how old your child gets, there is always a learning curve when it comes to confronting the issues that present themselves. In fact, I think in so many ways we are in uncharted territory for them and yes, we really do make it up as we go along at times. We figure out what has worked before and if it doesn't work anymore, we tweak it, rearrange it and modify it so that we can see if they are being benefited or harmed. The article goes on to say that the satisfiers are the ones who are truly happy in life. In fact, the researchers say that as people age, they are more likely to be satisfiers than maximizers. Apparently life teaches you lessons about what is truly important. I am not certain that that actually works for families with loved ones with special needs. Our world is not typical. In fact, as we age we find more and more things to be worried about. I think we will find happiness when we know that our children's futures are secure, which unfortunately is something out of your hands no matter how much you plan, simply because one day you will pass on and your child(ren) will be either on their own or at the mercy of society. Lucky are those with family to watch out for their special needs children when they are no longer here to protect them. Honestly, (and I may be wrong) I don't see it as much of a "control issue, or helicopter parenting issue" over the boys, but more as a "protecting their vulnerabilities from people that would take advantage of their nature," issue. Example: Mr.GS woke us up at 2:30 one morning telling us he needed over $200 dollars so that his computer doesn't crash. Apparently he had been watching videos and a pop up warned that there were evil viruses lurking in his hard drive. Hubby got on the phone with the salesperson and politely took the name and number to call back. When we woke up I looked at what was going on and showed Mr.GS the virus software, did a defrag of his computer and organized it a little better. But there was nothing wrong with the harddrive, it was merely a scam for the unsuspecting. The ironic thing here is that MrGS, the computer science maven, doesn't actually pay attention to how the computer itself works. Its not important to him. It's what he can do with the computer that counts. "Creating things out of thin air (coding) makes him feel like a wizard." That is what makes him happy. Brilliant-computer-sis told me that this is not unusual for coders. For some it is not even about the end product, but about the beauty of the code that counts. A form of poetry if you wanted to get romantic about the subject. Seems Mr.GS fits that bill. Meanwhile, hubby was very upset. He now worries about Mr.GS' gullibility when it comes to issues like this and is terrified that one day, after we are gone, someone will steal the boys' money and leave them homeless. So we discussed this issue with the behaviorist and it is one of the new issues she is working on with both boys this year. How to teach the boys to protect themselves from those who would do them harm. It is not an easy task. They have no guile and they have no evil intent in themselves, so it is hard for them to really see the nasty side of the individual person. (Yes they see the general evil that is shown on the news, but luckily it does not translate into their daily lives in any way shape or form.) The hardest part is how to teach them this skill and not scare them off of other people entirely. For the boys it's all or nothing. No gray areas. Everything is black and white. So yes, we are satisfiers in some respect in our daily lives. Having gone through periods of need and unnecessary desire, we realized how much we can do without when it comes to our personal lives and in many ways that makes us more content and happier. We sold off what we didn't really need, gave away the superfluous and settled down in our post 40s to a more simpler way of life. We would like to travel again one day though. A nice vacation to look forward to and a fancy hotel. But in the meantime, that is not "in the cards," as they say, and will not be for a very long time. Quiet and contentment is the real longterm goal. On the other had, I think we are maximizers when it comes to our boys. We consistently plan and try to figure out what is best for them and how to make their world a better place. In some ways though we need to come to the conclusion that we cannot control everything and that we need to have a little faith in others. Honestly, I am not ready to do that, and neither is hubby. We have a long way to go until we reach that point where we will be satisfied with the world that we leave the boys. Another day, another challenge. And to that end, I have set up a meeting with a new, highly recommended estate attorney who specializes in helping families dealing with all manner of special needs issues.